Table mirrors are a versatile accessory that can be used around the home to reflect light and add those all important finishing touches to any room. Whether you';re entertaining or just like to add new features to your home, table mirrors are a contemporary style statement worth taking note of! A table mirror is a fresh new take on the traditional centrepiece. Table mirrors can be used to add depth to a table and look beautiful with candles placed on top or as part of a larger table feature, for example flowers. Used creatively, our table mirrors can create wonderful effects and a lovely atmosphere for the dinner table. Made from strong acrylic so you can rest assured they won’t crack or shatter like ordinary glass, our table mirrors come in two options; pre–cut or made to measure. If you';re open to ideas, why not browse our pre–cut range? If you know exactly what you';re after and have specific measurements to stick to, our made to measure service is for you. Our exclusive service means you’ll always find table mirrors to suit you – so what are you waiting? Browse our website or use our made to measure tool today and accessorize that table in style. 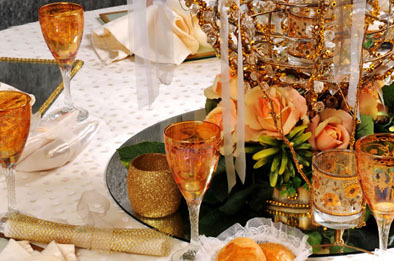 Are you looking for a way to enhance your table decoration? Table mirrors bring a fresh dimension to table-top displays. 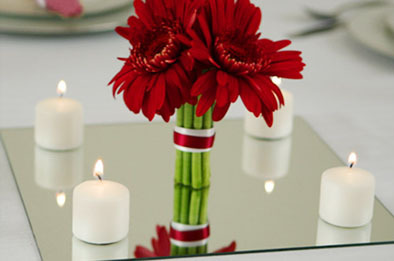 Used creatively, these simple and cost effective mirrors can enhance any table setting...e.g. Place one under the table centrepiece to create the effect of floating on water. Our table mirrors are available in a range of Shapes and Sizes. Made from strong Acrylic mirror, which won’t shatter or break like ordinary glass. For your convenience we’ve two easy purchasing options. Doing just what is says in the tin, our Pre-Cut sizes are the quick and simple method to purchase table centre piece mirrors. Just choose the Size, Shape and Quantity required then click it into your basket, pay and your done. Or for those more demanding applications try our free online tool to choose your Size, and Shape, with the confidence of obtaining an instant quotation before ordering. Mirrorworld have shapes and sizes for all your table decoration ideas. If you can't see the right product for you, call one of our sales team, they'll be pleased to help.